I just spent an idyllic Sunday sketching outdoors at Kuerner Farm, the Pennsylvania dairy farm Andrew Wyeth visited repeatedly for seven decades, and the spot where he found the subjects of many of his most inspired paintings. One of those is Trodden Weed, based on a 1951 drawing he did of himself traipsing one of the Kuerner family's fields. Wyeth had encountered near-death the previous year, when he flatlined during a surgery to remove pieces of his infected lungs. Recuperation took months, during which time he spent many hours walking about his neighborhood for exercise. The idea for the self-portrait came to him during one of these outings. In a 1952 letter to Art News, Wyeth said, "The painting came to signify to me a close relationship between critical illness and the refusal to accept it—a kind of stalking away." He later told an interviewer, "I suddenly got the idea that we all stupidly crush things underfoot and ruin them—without thinking. Like the weed here getting crushed. The black line is not merely a compositional device—it's the presence of death. Before my operation, I had been looking at Albrecht Dürer's works. During the operation they say my heart stopped once. At that moment, I could see Dürer standing there in black, and he started coming at me across the tile floor. When my heart started, he—Dürer—death—receded. So this painting is highly emotional—dangerous and looming. I like it." 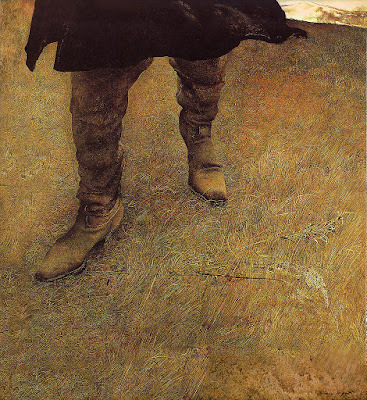 Art critics have noted that Trodden Weed represents a turning point in Wyeth's work, a departure from sentimental subjects to fierce ones. On that operating table, Wyeth became what Roman Krznaric calls a death gazer, a person "who decides to seize the day after coming face to face with death." Psychologists have studied death gazers and label their response to oblivion "post-traumatic growth," Krznaric says. A brush with the Grim Reaper propels some survivors to become caregivers or preachers. "But one of the most prevalent effects is that it induces a carpe diem zest for life," Krznaric says. "People abandon their tedious jobs, embark on bonding travel adventures with their children, or dedicate themselves to taking chances and squeezing every ounce of experience out of being alive." Or, like Wyeth, they become lifelong fans of the weeds underfoot.